When the ART X Lagos 2018 press release arrived in my email describing the fair now in its third year as the “Frieze of West Africa”, I thought it was odd but could not at the time resolve what my problem with it might be. Later that weekend, a journalist friend would describe the tag, ironically as an “anointing”, alluding that the fair was made whole and anew, by this association with one of the leading fairs in the world. Then it made sense. It was a very familiar trick, after all. ART X Lagos was ascribing itself to that which was foreign, and which was supposedly better because describing it as just an “African fair” wasn’t nearly enough. Insufficient. Inferior almost. It is the same reasoning behind calling Lagos’ tech sector for instance, “Yabacon Valley” (as in Silicon Valley), or calling one of the greatest Nigerian musicians, Onyeka Onwenu “our Diana Ross” and Ben Enwonwu’s Tutu’, “the African ‘Mona Lisa”. Apparently, explaining or couching that which is ours in Western language presumably elevates it, gives it value, which it does not have enough of otherwise. Asides being bedevilled by what Fela Anikulapo-Kuti calls “colo-mentality”, the fair had a rich, joyous air. Galleries – preselected by the curator N’gone Fall and collector, Femi Lijadu – seemed to have put forward almost exclusively works and artists that captured a certain joie de vivre, at least in the aesthetic and media of the works rather than their subject matters. The star of the fair in my estimation, was no doubt Ghana’s Gallery 1957’s Gerald Chukwuma who showed a new body of work definitely deserving of a grander platform in the future and perhaps, then, more physical space to engage them. 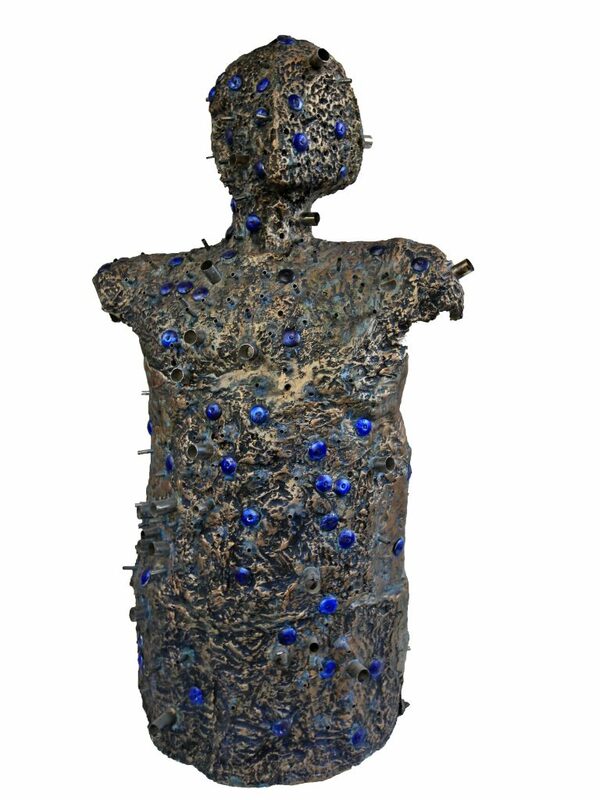 His works, predominantly sculptures of wood and metal were large and imposing. Two of the works made of molten, carved metal and washed in paint, formed two human bodies cut off at the torso, were waist high. A collection of busts, their faces better defined than the other pair sat with huge chains, around their necks. 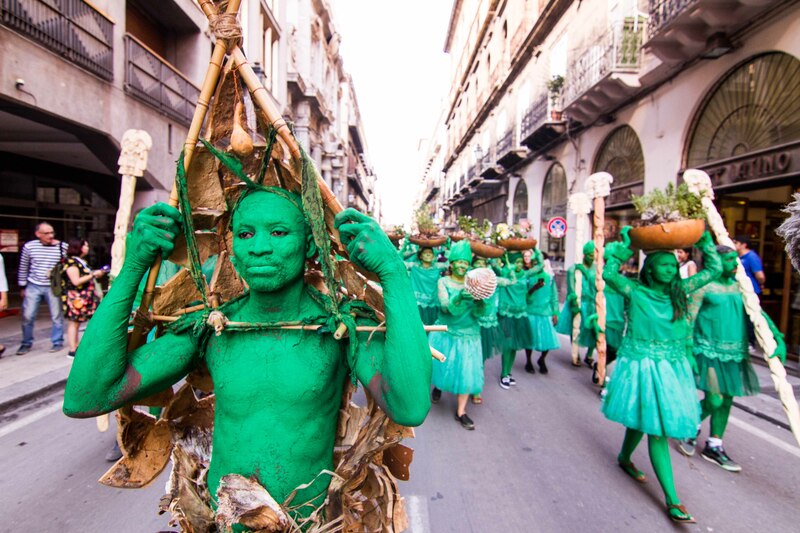 The artist explained in a catalogue statement that the works came from an apparition he saw in the Oguta River that reminded him of the rebellion of Igbo slaves being transported across the Atlantic hundreds of years ago. In that rebellion, the slaves believing the water would carry them home, walked into it and more or less committed suicide. The slave rebellion known as the Igbo landing, is factual. It was unclear if the apparition the artist saw was fictional. 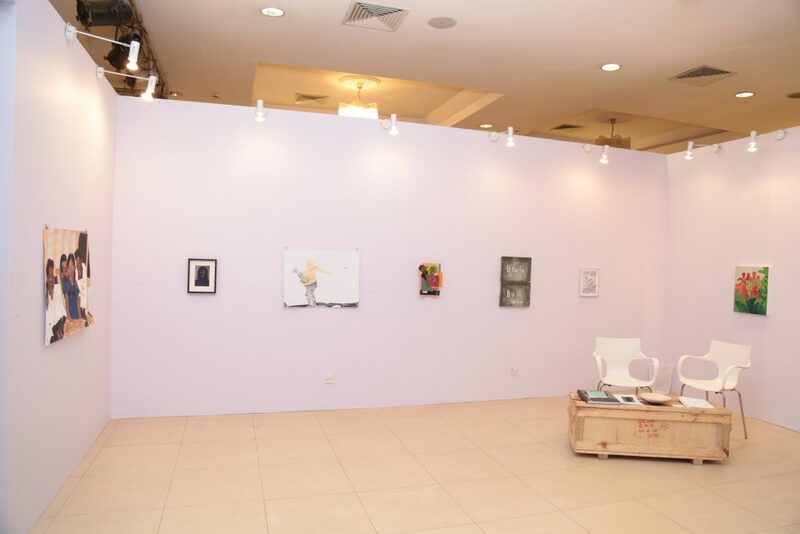 Further inland in the fair space, British-Nigerian artist Joy Labinjo was part of a Stevenson Gallery booth that stood out for how understated it was. Unlike Gallery 1957, Stevenson had a big booth with fewer works. Labinjo’s paintings which take inspiration from family photographs depict leisurely Nigerian life: reminiscent for me of after church Sunday lunches and weekday evenings by the TV. Her work also calls Njideka Akunyili-Crosby’s to mind for their related subject matter though the painting technique is markedly different. At Artyrama, it appears brisk business had been conducted. When I visited, it already had two or three red sale dots. 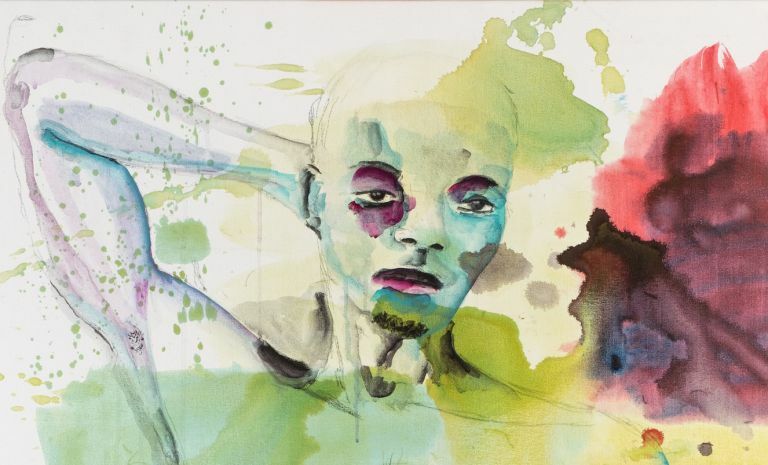 The Nigerian, online only gallery – which curiously still has offsite physical events – was showing two young artists in their 20s: Ayobola Kekere-Ekun and Ken Nwadiogbu. Kekere-Ekun had quilled a fascinating story, “The Real Housewives of Old Oyo”, a feminist retelling of mythical goddesses who do not get the same space in history as their male contemporaries. Kekere-Ekun who realises her work by manipulating paper – known as quilling – appears to be attempting more intricate, complicated forms, in bolder, contrasting colours. For Nwadiogbu, Artyrama showed, “The King Series”, hyperrealist drawings of traditional Kings which also featured a woman, the artist’s comment on subverting who has access to power. ART X Lagos had HRH Obi of Onitsha and the Ooni of Ile-Ife, in attendance. I wonder what they might think of a female King. At the SMO Contemporary Art booth, something fascinating took place. The alternative space – which has no physical gallery of its own – showed four artists, only one of which was Nigerian: Ranti Bam. The rest were Armand Boua from Cote D’Ivoire, Florence Poirier-Nkpa from the French West Indies and Victor Butler from Ghana. Perhaps it is a sign of the growing taste of Nigerian collectors, to consider or even buy works unfamiliar to the Nigerian market, even if accomplished elsewhere. The curating of the booth – on off-white and red walls – helped put Butler, Poirier-Nkpa, and Boua’s best foot forward. It was curious to watch that a painting invite such excitement. That it could transcend fine art into a cultural product, a national treasure, and a source of inspiration. At the ground level of the fair, guests milled around for photos with Ben Enwonwu’s Tutu. 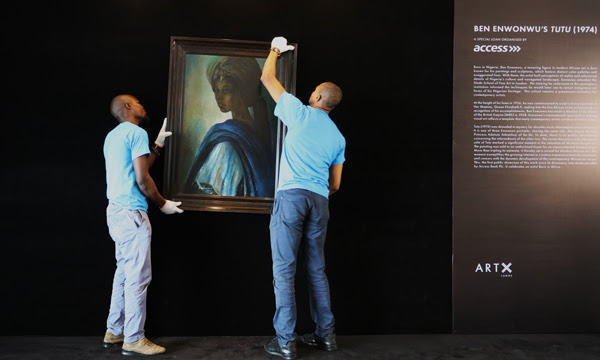 Tutu, painted in 1974, lost or disappeared, depending on who you ask, was discovered in “a London apartment” decades later and sold for a £1.2m pounds at the Bonhams auction in May, a record sale for an African artist. It had finally returned to Lagos, where the artist called home for many years. The presentation of the painting rose to the occasion, with 6-feet tall, heavy set bodyguards keeping watch, a significant distance and physical barricade set up between the painting and the closest viewer. It was curious to watch a painting invite such excitement. That it could transcend fine art into a cultural product, a national treasure, and a source of inspiration. And it possibly will. 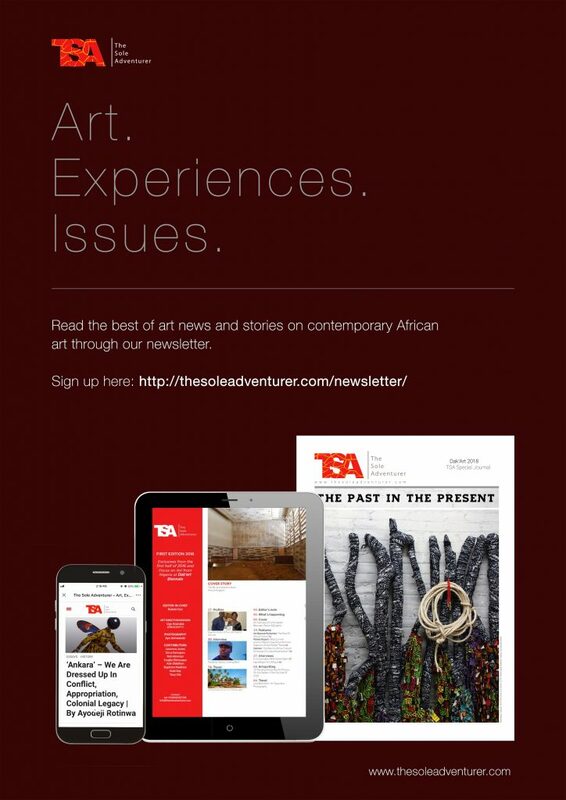 ART X Lagos has thousands of visitors most of whom share their experience instantaneously online. In an age of viral Banksys, artist careers’ dead or alive, growing exponentially with the help of the world wide web, this is the perfect setting. For not just the Tutu even but possibly other works of visual art in the foreseeable future. Yet the fair does not acknowledge its own power. It calls itself by another’s name. Keep telling the truth. It will not always be easy, but keep doing it anyway. Despite the intention of Western education’s attempts at liberating the mind, manu Nigerians and Africans bask in the tepid filth of self inflicted blindness of distaste for our own. Many are so unoriginal in their perception of the novelle offerings and creative output we present. We really must commend authors that continue to decry this path of self debasement.